BOWLING GREEN, Ky. - With All-Stars Vidal Brujan and Moises Gomez leading the way, the Bowling Green Hot Rods held off the Lansing Lugnuts, 4-3, finishing a two-game sweep in the best-of-three Eastern Division Semifinals on Thursday night at Bowling Green Ballpark. It was the first series victory in the Hot Rods' franchise history, accomplished with the same score in back to back games: a grueling 4-3 10-inning victory on Wednesday night in Lansing, an eight-hour drive through the early hours of the morning, and a dramatic near comeback by the Lugnuts in Bowling Green. Trailing 4-1 entering the ninth inning, the Lugnuts' Samad Taylor and Norberto Obeso lined singles off Tyler Day (Save, 1) to bring the potential game-tying run to the plate. Chavez Young lined out hard to deep right, moving Taylor to third base. Ryan Noda followed with a towering sacrifice fly to center field, moving Obeso to second and scoring Taylor to narrow the deficit to 4-2. Brandon Grudzielanek came through with an RBI single up the middle, pulling the Lugnuts within a run. But Ryan Gold flied out to center, ending Lansing's 23rd season in the Midwest League. Vinny Capra had given the Nuts their first lead of the series, singling in Noda with two outs in the second inning against Hot Rods starter Tommy Romero (Win, 1-0) for a 1-0 lead. Then Brujan and Gomez, the Hot Rods' 1-2 hitters, took over. Brujan led off the fourth with a single against Lugnuts starter Graham Spraker (Loss, 0-1) and Gomez followed with a two-run homer for a 2-1 lead. In the sixth, Brujan sizzled a triple down the right field line and Gomez lined an RBI single to left to put the Hot Rods up, 3-1. In the eighth, Brujan supplied what turned out to a crucial insurance run. He drew a walk from reliever Brayden Bouchey , dashed to third when Bouchey threw away an attempted pickoff, and scored the eventual game-winning run on a Taylor Walls fielder's choice. The game featured a pair of fine pitching performances from the starters. Romero, the Midwest League's Post-Season All-Star at right-handed starting pitcher, held the Nuts to one run on four hits and one walk in seven innings, striking out six. Spraker also worked seven innings, striking out three while giving up six hits. one walk and three runs. Lansing leadoff hitter Taylor went 2-for-4 with a single, double and run scored in defeat. Bowling Green advances to face West Michigan in the Eastern Division Finals for the chance to play for the 2018 Midwest League Championship. 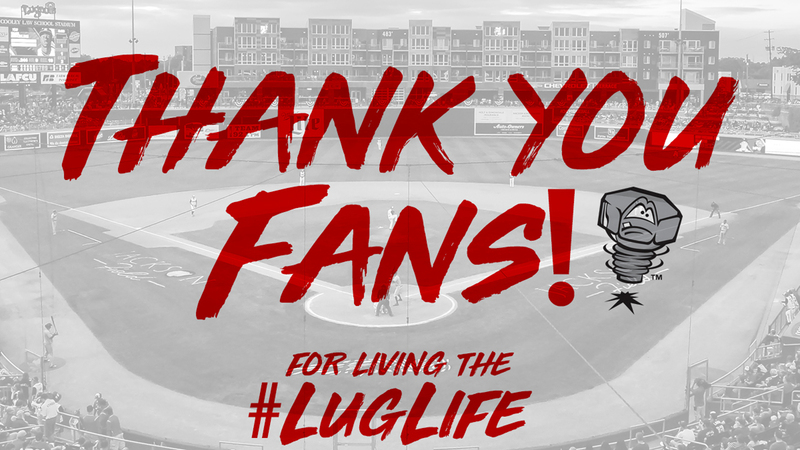 Stay tuned to lansinglugnuts.com for the latest in Lugnuts news throughout the offseason, with the 24th season of Lugnuts baseball opening up in April 2019.